It’s Friday, everyone! 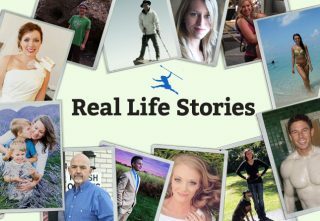 And that means another Primal Blueprint Real Life Story from a Mark’s Daily Apple reader. If you have your own success story and would like to share it with me and the Mark’s Daily Apple community please contact me here. I’ll continue to publish these each Friday as long as they keep coming in. Thank you for reading! 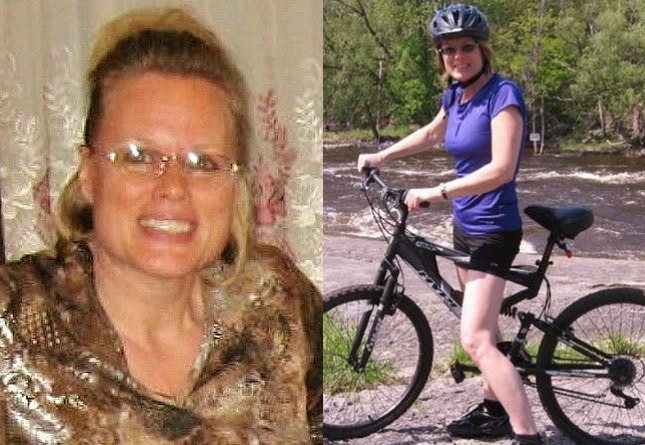 When I first started on a low-carb diet, I lost 35 lbs (16 kg) in five months. I had 24 conditions! But not all my ailments healed. I went down the rabbit’s hole and was able to turn my health around and cure a myriad of health issues with some additional measures. This is what I did. I have autoimmune disease (discovered myself by literally forcing the conventional docs to test me for thyroid antibodies) based on my research of my symptoms from various functional medicine doctors whom I follow…so I began researching healing autoimmunity within functional medicine and Mark’s Daily Apple. I eliminated gluten, dairy and similar proteins completely from my diet. This includes all store-bought breads, pastries, pastas, and milk and milk products, and replaced them with my own, home-baked, (primarily coconut flour) products, and nut milks, primarily coconut milk. This is where my fibromyalgia, headaches and lower back pain went away for good, I hope indefinitely. I gave up beans completely (too difficult to absorb, even when soaked), nuts (too much phytic acid in a healing gut). I gave up all processed/packaged foods, and bought and ate/eat only organic (unless ewg.org’s list says I can eat conventional). I consume pastured eggs only, grass-fed beef 1-2 times/week, wild-caught fish, and only hormone- and antibiotic-free chicken and turkey. I don’t use any conventional oils, only olive for my homemade salad dressings (your dressings are the only ones around with completely good for you ingredients, by the way!) , and coconut oil and grass-fed butter for higher-heat cooking. I eat an 80/20 raw diet. I have eliminated soy, and soy products, though I must admit, I still consume soy lecithin, as Chris Kresser, whom I admire, says it shouldn’t be problematic. I have an adoration of dark chocolate, you see… so it is unavoidable. I would make my own, but my time is limited, as I am a full-time nurse, wife and a mother as well. I consume a lot of supplements. No drugs. I won’t elaborate on it too much, as that would be very long, but I will say that my Vitamin D, B12, all cholesterol and thyroid lab levels are now optimal by functional medicine standards. Mainstream labs are based on sick people’s labs, and I’m aiming to be and stay well, not to get sick until I exceed their ranges of “normal.” I am using additional supplements and probiotics to boost glutathione, immunity, gut repair and cellular metabolism. I use your collagen powders to keep my gut healed and sealed. I also do about 5 minutes of targeted muscle training a day 5 days a week, nominal running, walking and biking. About six months later, after adopting the additional protocols outlined above, I felt great. I still do, another five years later. You wouldn’t guess to look at me that I’m 52. I feel better than I ever did in my life, and get around like a 20-year old. My only conditions remaining are some gas (from all the cruciferous veggies I eat every day in my salad), and thyroid antibody levels that have plateaued still outside of normal range. I surmise, accurately I am sure, that this is due to food sensitivities. I have completed a food panel, and am working on the food sensitivities found there by eliminating them. I hope that this is successful, as I know these antibodies may continue to wear away at my thyroid over time, possibly resulting in a reversal of everything I have accomplished. Hopefully, as per Dr. Izabella Wentz (I am one of her recommended clinicians), my consumption of Thytrophin PMG will target the action of the antibodies as opposed to my thyroid, and then all will be right with the world! Incidentally, I became so enamored with using food as medicine, that I went on to become a health coach through the Institute of Integrative Nutrition and board certification through the AADP (the Association of Drugless Practitioners. Now I help others realize their hopes and dreams the way I have! It should be noted, that I underwent all the above, totally alone. No family or friend support. It was very hard, but I was determined to decipher how powerful the proper consumption of food is for myself. From what I have read over the past four years, the odds are extremely low for success while going it alone. I almost ended up in divorce from my husband, and estrangement from my daughter, as I tried to help them with their problematic behaviors before they became sick as well. Now, in order to keep the peace, I must continue to go it alone, and keep my mouth shut. So far it is working, but the clinician inside of me worries for them. I’m definitely not perfect, I do let out some thoughts once in awhile! I would not change this way of eating for anything, and continue to advocate the same for anyone who will choose to listen to my story and other successes people have had that I have advised. Following this type of plan can and will indeed change lives. Want to make fat loss easier? Try the Definitive Guide for Troubleshooting Weight Loss for free here. The post I Feel Better Than I Ever Did In My Life appeared first on Mark's Daily Apple. Going back to the original “what I ate” style of KERF is something I think about all.the.time. If you’re new here, you might not know that for the first 5 years of this blog, I kept a dairy of nearly every meal I ate. I think I only missed a day here or there due to sickness or technical glitches. KERF was unique because when I started back in 2007, no one was logging their meals in real time. (There was also no Instagram or really any social media, so there’s that.) I loved blogging back in those days, and my days looked very different than they do now. Then: Because I was writing about my life, I lived more life! Blogging never felt like “work,” even when I was up blogging at 10pm. Posts were super quick to write because I was literally recapping my last meal and few hours. I enjoyed writing commentary on my food choices, and I loved reading so many comments from you guys. There were no evergreen or sponsored posts – everything was written in real time. Thus, when I finished writing about my breakfast I was done for the time being with nothing to work ahead on (except maybe a blog re-design or freelance project). However, there was never a true day off, even on vacation. But it had a very freeing feeling! Income was solely based on ads, freelance work, and some affiliate links. Now: I spend my days writing posts to be published in the coming weeks. Posts take much longer to prepare, and sponsored posts can take days to create, especially when there is a lot of back and forth with a brand. I sometimes feel stuck on what to write about, and I am torn between posting real meals that seem boring with the oversaturated social internet and delay and evergreen posts that also seem boring for their lack of personality infused. I spend a lot more time at the computer, but I am able to work ahead so that I can take full days off to spend with Mazen or travel. Income is based on a combo of ads, sponsored posts, and affiliate links. The internet is always changing, as is my life. Part of the reason why I transitioned into more evergreen blogging is because as a new mother in 2012 I could not keep up with the “every meal” schedule. And when I switched to once-a-day recaps, I had to write them at night when I was totally exhausted. Because KERF has always been about my life, it’s funny to think about it in such an objective way. But his comments had my gears spinning. I shared the above poll a few weeks ago on Instagram in hopes of figuring out what you guys want. Some of you say whatever shows up in your KERF RSS feed is what you will read and love, and others of you have very strong opinions on what you like best. You might say to me: “Write about what you want to write about” but the problem is I don’t know! 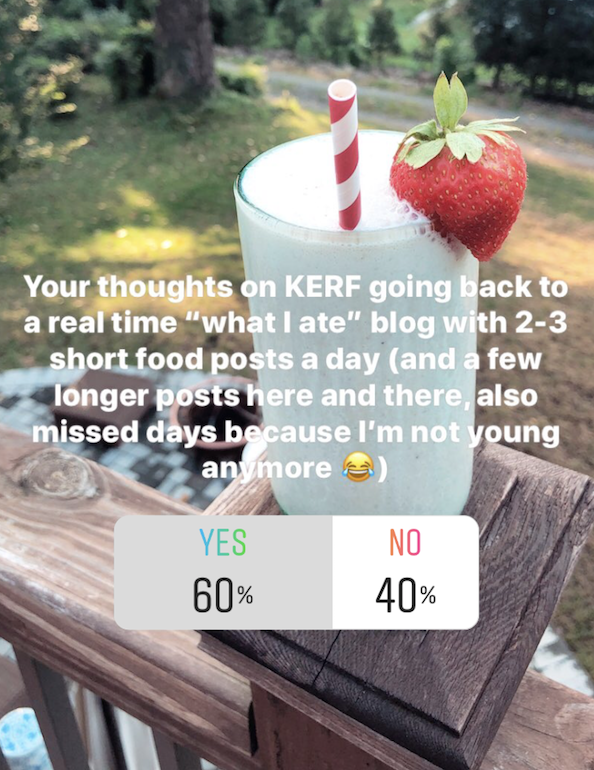 I feel that it has to be one way or the other, even though KERF today is about 50% prewritten and sponsored and 50% current lately/weekend/lifestyle posts. I sort of feel like to strengthen my brand, I need to go one way or the other and narrow my focus a bit, or at least make one the majority and one the minority. I don’t want to give up sponsored posts because they provide such a great source of my income and I enjoy the creativity of working on them, but I want to find a way to weave them in between real time posts. I’m wondering if each day I could either publish a sponsored post OR 2 posts about real meals, distinguished between their titles somehow. I’m also afraid that if I just start posting one picture of a meal and jotting some notes about my day that you guys will give up! Posts like this and this. I used to post 5-8 photos of the same meal. Some of you loved that and some of you hated it. I think that’s why I’m I am paralyzed by indecision: because you guys seem so divided! If my poll had yielded 90/10 results, I would have a clear answer. But 60/40 is not exactly a slam dunk in one direction. I also have no idea what life will be like with a newborn again. Part of me knows I won’t be able to sit and write longer-form posts on topics, so that’s one reason why I’m leaning towards a few pictures of meals (and baby) and some life commentary to go with them. But part of me remembers that I had to give up real time blogging when Mazen was born, so does that make me insane to attempt it again? All this to say. I need more feedback! Tell me the pros and cons. What do you want to see and why? The post The Pros + Cons Of Real Time Blogging appeared first on Kath Eats Real Food.